Irish moss gel is a popular ingredient used these days among vegan chefs when making a wide variety of foods, drinks and desserts. As an emulsifier it can literally transform the textural qualities of certain foods, helping to bind fats and liquid water-based constituents. Made from natural whole unprocessed seaweed, the gel is an excellent way to increase nutrition yet reduce the amount of calories in desserts like puddings, ice creams as well as raw cheesecakes and pies. 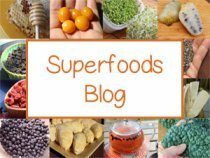 It is also helpful when trying to cut back on higher proportions of nuts and seeds incorporated into many raw recipes and can likewise be used as a substitute for oils, fats and dairy in dressings and sauces. Because jars of irish moss gel can be stored for long periods of time in the refrigerator, sometimes several weeks when kept cold, it makes a convenient food to have on hand for blended smoothies, shakes and other beverages. 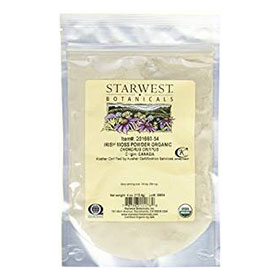 Making irish moss gel is quite simple, but does employ the use of a high speed blending device. 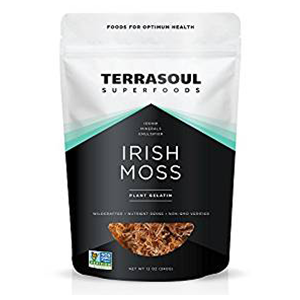 When preparing it, most people use the whole irish moss or gracilaria variety, rather than the true "Irish" Chondrus crispus species, which is usually sold as dried flake pieces rather than as a whole seaweed. We have, however, made this recipe using both types. Although Chondrus crispus is higher in nutrients, it has a slightly stronger flavor and produces a darker gel that is less desirable for use in recipes. 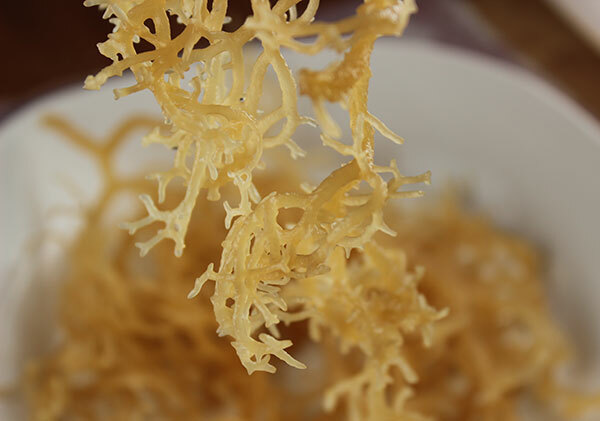 Gracilaria sea moss is virtually tasteless with a subtle seaweed scent that is not as noticeable when camouflaged into drinks and desserts. It basically tends to take on the flavors of the foods and spices used with it. 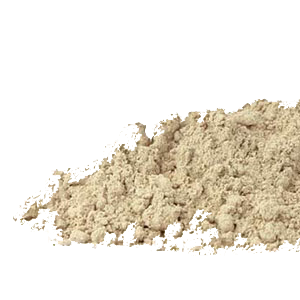 Both types of blended irish moss have been used extensively in locations where is grows, such as Jamaica, Ireland and Scotland. Being somewhat mucilaginous when soaked in water, it isn't one that you wouldn't normally eat like other sea vegetables. 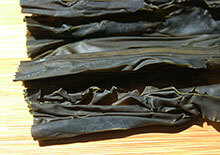 Unlike nori, kelp or dulse, it has a tough and rubbery texture that is largely inedible. 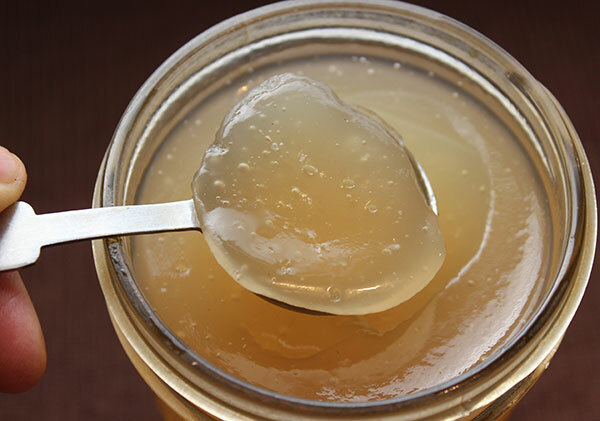 While it is traditionally simmered before pulverizing, modern-day recipes often use the raw blended gel which can be added to various foods and drinks as a nutritious thickening agent. 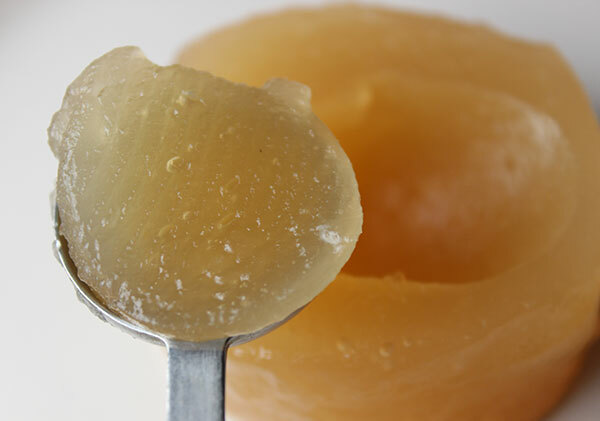 It is often used as a vegan substitute for gelatin as it provides a similar "gelatinous" consistency. The seaweed needs to be thoroughly rinsed before blending as there can be quite a bit of salt, sand and debris on the fresh dried whole varieties. After soaking it usually loses much of its color and becomes almost translucent. One cup of moss will expand considerably, nearly 4 times its original size. It is then blended with water in a high speed blender for 1-2 minutes. This slightly heats the moss and usually produces a pourable creamy texture, depending on the amount of water integrated. Irish moss gel is a "time released" energizing fuel source, providing long chain polysaccharides that help to deliver nutrients over a longer period of time for a slower and more sustained nutritional uptake. 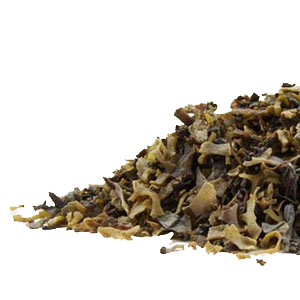 The seaweed is also an excellent respiratory tonic, mild laxative and skin healer that is also helpful for strengthening the connective tissues and joints. 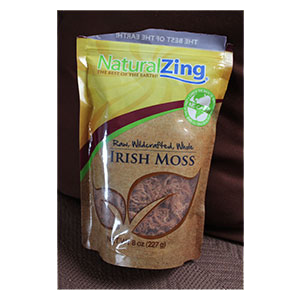 For more information about irish moss versus carrageenan extract, please visit our irish moss page. 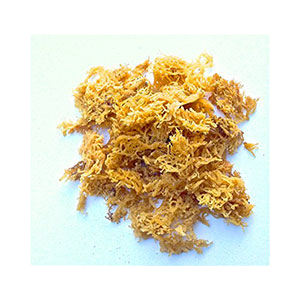 Irish moss gel is a source of the polysaccharide carrageenan, which makes up to about 55% of its volume. This is the aspect responsible for its properties as a gelling medium. 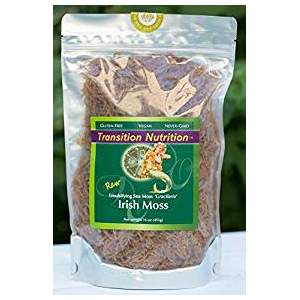 Irish moss, as a natural form of carrageenan, has been used for centuries to aid and sooth gastrointestinal issues and inflammation in the body. The seaweed consumed in its whole state is not, however, the same thing as "carrageenan extract", a highly processed emulsifier and food additive approved by the FDA for use in the commercial food industry. Used as a stabilizer in many processed foods, carrageenan extract or "gum" has been the subject of much debate among health-conscious consumers for its studied links to a variety of gastrointestinal disorders including inflammatory bowel syndrome, intestinal ulcerations and tumor growths. 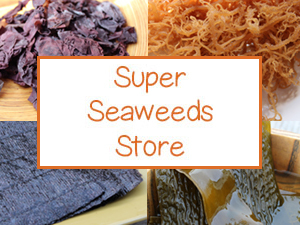 Whole dried irish moss seaweed, especially the gracilaria variety, is not usually available in most markets or health food stores. The best way to purchase it is through online suppliers. We list our top favorites here on this page. 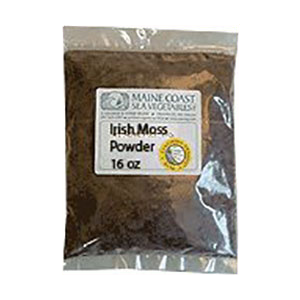 Most are sold in 1 pound bags (16oz) bags which can be stored for long periods of time, providing quarts worth of irish moss gel for many months. 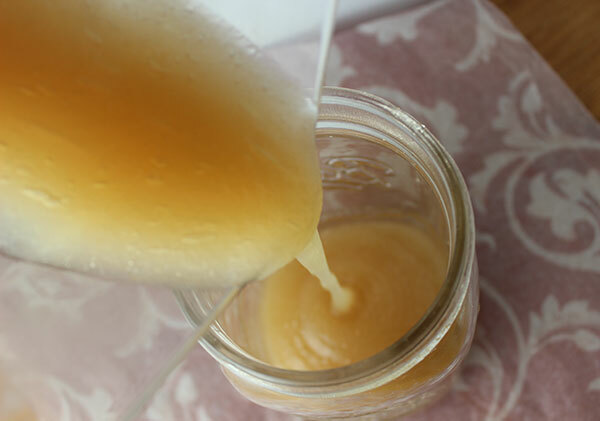 This recipe makes half a quart or more of gel. Thoroughly rinse 1C of the dried whole seaweed in pure water by soaking it for 20 minutes. Rinse again to remove any sand or debris. Place the irish moss into a quart jar and fill with pure water. Soak overnight or at least 8 hours (so it will be easier to blend smooth) and strain. Add the moss to a high speed blender (like a Vitamix or Blendtec) and add just enough water to cover it, usually 2C works well but it can vary depending on the seaweed consistency. Blend until smooth, which may take a few minutes and will turn a cream color. It is pourable at this point but will solidify when chilled. Pour into glass jar and place a lid on top. Store in the refrigerator for on-hand use in drinks and recipes. 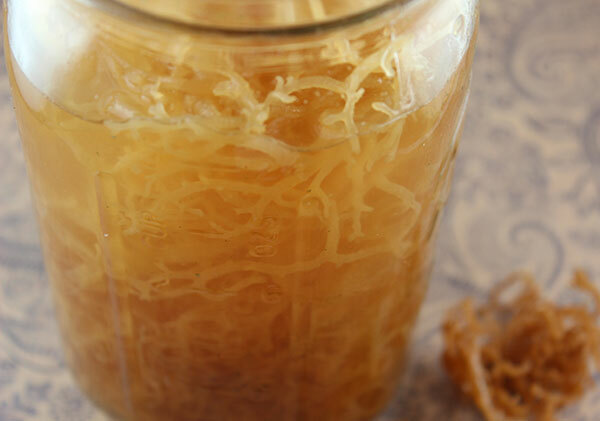 Again, the gracilaria variety is a very popular ingredient these days in raw dessert recipes as it creates a thick consistency perfect for shakes, raw cheesecakes, non-dairy ice cream, sauces, dressings, jams, puddings and chutneys. The blended gel can also be added to miso soup broths along with other seaweeds. Likewise, the whole or dried pieces can be simmered and strained to create a thick nutritious soup stock. Its skin softening and healing properties provide an excellent facial mask, using the gel recipe above straight from the blender. 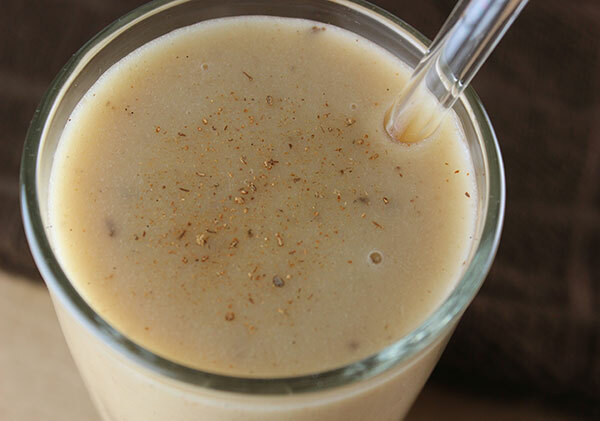 This is an irish moss drink made Jamaican-style. 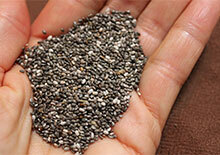 Instead of rum or flax seed, which are traditional ingredients, we use ginseng tincture and chia seeds. Blend all of the above ingredients until smooth. Blend with ice or serve chilled in your favorite glass. Excessive amounts of irish moss may cause loose stools as it is a mild laxative. It is best to avoid intake if diagnosed with hyperthyroidism. Seek the advice of a health care practitioner if pregnant, breast feeding or taking prescription medications, especially blood thinning drugs.